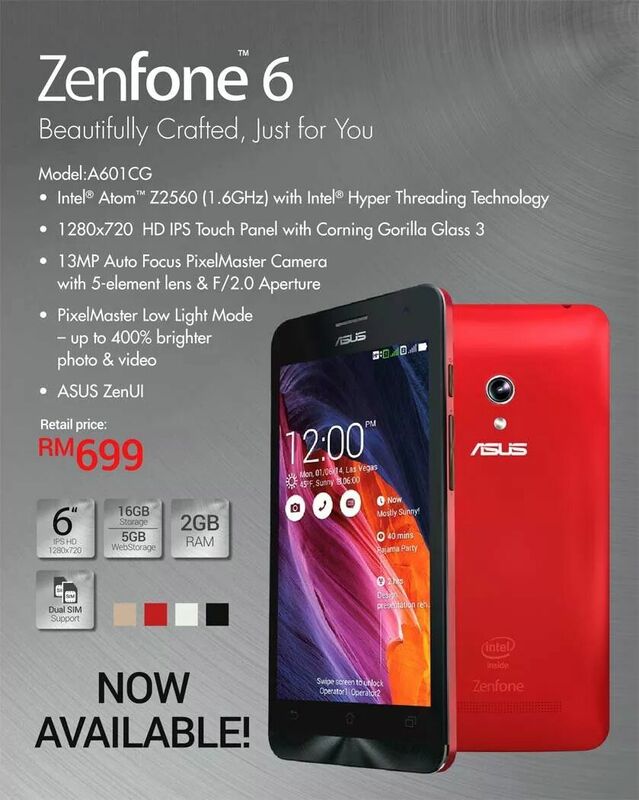 ASUS Malaysia have announced the later version of ASUS ZenFone 6, which is A601CG, officially priced at RM699 at all retailing outlets. This is of course a replacement model for the previous one which is A600CG. What is the difference? Well, only the processor has been changed to Intel Atom Z2560 processor clocked at 1.6GHz while the previous one was a Intel Atom Z2580 processor clocked slightly higher at 2.0GHz. Some recap on rest of the specifications. The ZenFone 6 comes with a IPS HD display ( 1280 x 720 ) which comes with Corning Gorilla Glass 3 protection. Comes out of the box with Android 4.3 JellyBean with the option to upgrade to Android 4.4 KitKat which is coming soon. The ZenFone 6 has a 13MP main camera with PixelMaster technology which is a superb performer for taking photos during low light conditions. The low light mode is said to have the capability to increase light sensitivity up to 400%. For selfies, you get a front camera set at 2MP. You get a 2GB of RAM and 16GB of ROM which has the micro SD slot which allows you to expand your storage capacity up to 64GB. Last but not least you get a massive battery capacity of 3300mAh which will provide you a great battery life of up to 2 days on average usage. Oh and yes, the ZenFone 6 is a dual micro SIM smartphone with dual standby without LTE of course limited at only HSDPA+ . Well, ASUS Malaysia decided to reduce the price of the ZenFone 6 by swapping the processor to a slightly lower performer compared to the previous one. The ASUS ZenFone 6 ( A600CG ) which is the older version was priced at RM899, so with the introductory of the new ZenFone 6 ( A601CG ) you get to own it at a much cheaper price of RM699. So now the decision is on your own hands, would you now still consider getting the ASUS ZenFone 5 or the all new ZenFone 6?